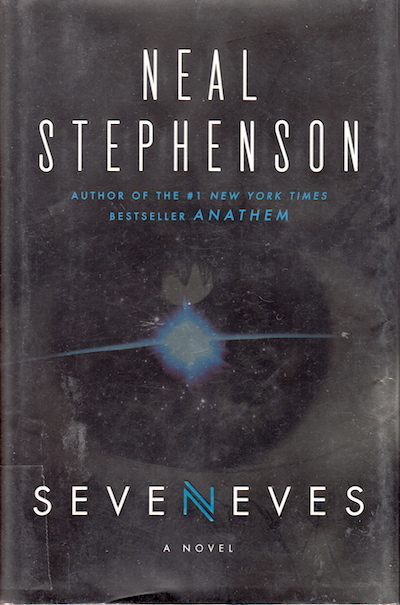 Seveneves is about the end of the world. In short: something very odd happens and the moon breaks into seven chunks. At first, no one really realizes what’s going on, until the Neil DeGrasse Tyson character figures out that those chunks are going to keep hitting each other, breaking up, hitting each other some more, keep falling to Earth and causing lots and lots of damage. Thus ending the human race. So how do we react? What do we do? How do we use our current space technology? How do we use our other technology? The book above sounds kind of interesting and problem-solve-y, right? Too bad it wasn’t what I thought I was getting into. I thought it was: the world ends in the first two chapters, and the substance is going to be about rebuilding the world. Nope. Not in the slightest. I would never have picked up Seveneves if I’d realized that it was about the breakdown of society instead of the rebuilding. I don’t like those kinds of books – society has all kinds of troubles already. It didn’t make me reflect on how the moon chunks hitting the Earth are like climate change and how people are (or aren’t) adapting to or planning for that. I read enough about the fights between countries and the politics of reducing carbon emissions and get frustrated by not being able to do enough. Ultimately, it made me feel powerless and impotent. I wouldn’t be able to do anything if the world were ending (say, because of climate change). With the systems we have in place, with our old-school electrical grid and society formed around consumption (which still requires that we use carbon-based fuels to produce all that *stuff*), I can only do so much. The system needs to change – more electric cars, less consumption of stuff more of experiences and services, especially in the United States, communities need to be built around walking and biking, not around driving – and I can buy fewer things and get an electric car when my old one finally gets used enough to warrant replacing and maybe eventually move to a city where I don’t need a car. But that’s just me. There are over 7 billion people on the planet. I can only do so much. I don’t like feeling powerless and impotent. So I put the book down. Maybe I’ll pick it up at a different time. Maybe not. We’ll see.